Faustino VII Rioja Rose is a popular Spanish Rose Wine available from DrinkSupermarket.com in 75cl to buy online. 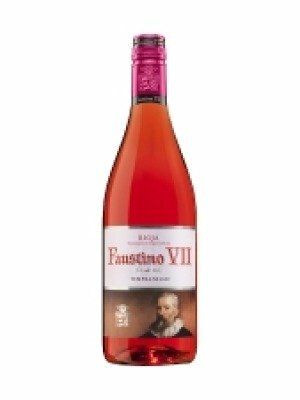 Visit DrinkSupermarket.com for the best price for 75cl of Faustino VII Rioja Rose or compare prices on our other Spanish Rose Wine products. Made from 80% Tempranillo and 20% Garnacha the wine combines a pretty pink colour with good fruit fragrance and taste and a gentle straightforward balance of acidity and alcohol. At only 13% alcohol this wine avoids the 'hot burn' and clumsiness often associated with rose wines. Where to buy Faustino VII Rioja Rose ? Faustino VII Rioja Rose Supermarkets & Stockists. You can buy Faustino VII Rioja Rose online in most retailers and find it in the Spanish Rose Wine aisle in supermarkets but we found the best deals online for Faustino VII Rioja Rose in DrinkSupermarket.com, TheDrinkShop, and others. Compare the current price of Faustino VII Rioja Rose in 75cl size in the table of offers below. Simply click on the button to order Faustino VII Rioja Rose online now.